On the weekend 19th -20th September 2015, the North Central Malleefowl Preservation Group (NCMPG) held a malleefowl monitoring workshop to train new and continuing volunteers in the use of smart phones for monitoring malleefowl activity in our region. 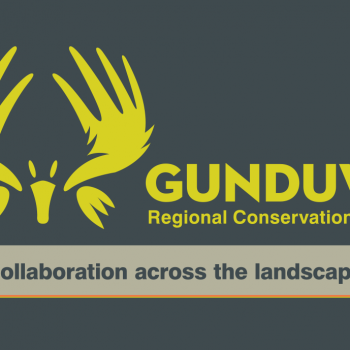 The weekend was funded by a grant from the Gunduwa Regional Conservation Association (RCA). This is the second year that the Gundawa RCA has awarded a grant to NCMPG for its practical conservation work. Gunduwa is funded through the lease agreements and interests of Extension Hill and Mount Gibson Mining and offers grants for research projects that have significance within an area which includes parts of the Dalwallinu, Perenjori, Morawa, Mullewa, Yalgoo, Koorda & Mount Marshall Shires. Gunduwa RCA had its inaugural AGM in April this year in Dalwallinu and elected a management committee to oversee its engagement with conservation research in the region. Malleefowl are considered a threatened species in Australia and the NCMPG has operated as a local voluntary organisation for 21 years working within the community to survey and locate malleefowl mounds and to monitor and preserve malleefowl activity in the Dalwallinu and Perenjori Shires. Members celebrated their 21 years of achievements with chocolate cake at a dinner on the Saturday night of the workshop. Invited guests from Victoria who are part of the National Malleefowl Recovery Team joined NCMPG for the weekend’s activities. The data that members of NCMPG collect about malleefowl concerns the presence of foxes, cats and other predators, the height, depth, shape and size of mounds, recent scrapings and footprints, the presence of egg shell and other evidence of activity. This information and photos of the mounds are uploaded to the national malleefowl database where they become a permanent record of the landscape and a resource for the development of state and national strategies for malleefowl conservation. You may have seen signs erected by the group which ask motorists to be aware of the presence of malleefowl near roads. The instinct of malleefowl when threatened is to stand still and while this is successful in the bush where they are well camouflaged it does not work well on our roads. Drivers need to be especially careful during harvest when malleefowl are often seen eating the grain that has collected on the side of roads. The participants were enthusiastic about the training they received and expressed their interest in volunteering to help in future monitoring activity with NCMPG. 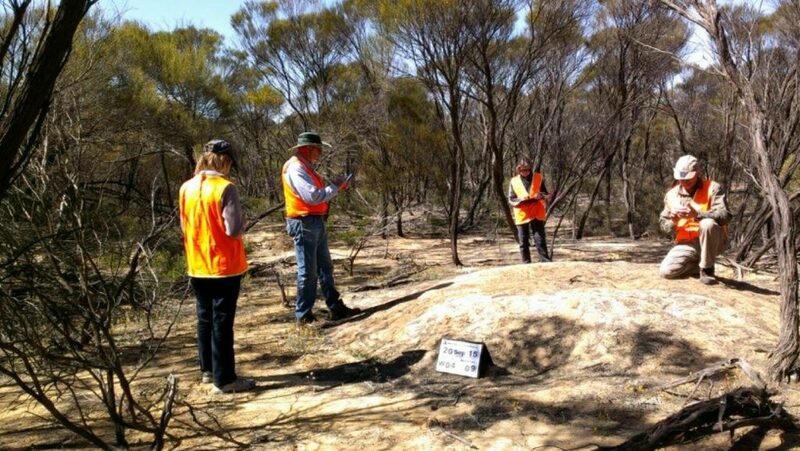 Monitoring with Tim Burnard (kneeling) National Malleefowl Co-ordinator from Casterton, Victoria.